Based on research by Gail Parr and Rex Sinnott, New Zealand, Feb 2013. John Haddock was born in 1841 in Kilcominick, Longford, Ireland. He married Sarah Qualtrough (1853 - 1921) in 1876; and he died on 30 Nov 1903 at his home in Pratt St, Auckland, New Zealand. See Chart 8 and the story about Sarah's life. John was a member of the Armed Constabulary stationed at Orakau Redoubt. Before he married Sarah he had tranferred to the contabularly of the New Zealand Police Force and when they were married he was stationed in Hamilton. It was while the family was at Warkworth that tragedy came in to the lives of the Haddock family. Firstly, Ada, at just four years old became sick and died in 1891, followed by Mervyn, only three years old, in 1892. Their tiny graves on the hillside above Warkworth bear mute testimony to the risks of pioneer life. John believed that because Mervyn had been vacinated for small-pox which resulted in sores breaking out all over his body; that this had weakened his immune system, subsequently leading to his death in 1892 of croup. John could not later, in court, prove that his boy had been vaccinated for small-pox as it appeared that the public vaccinator at the time, Dr Carolyn had failed to register Mervyn's name on the list. In 1875 an act was passed in Parliament making small-pox vaccination compulsory for all children under fourteen years old. Many people were suspicious of the vacination process. In June 1895, after ten years in the armed constabulary in Ireland, and 25 years in the New zealand Police Force John was dismissed (sacked) unjustly (as later events were to prove). A Doctor Shoesmith was appointed Public Vaccinator for the Mahurangi and surrounding districts in 1892. For reason we will never know John haddock did not trust this man and suspected he was not what he claimed to be. As a result John was accused of being the leader of the anti-vaccination group and influencing them to rebel against small-pox vaccination. As well as being the local policeman John was also the Clerk of the Court and as such he was accused of not ensuring that the summones that were to be sent to the rebel group and himself were not filled in correctly. Dr Shoesmith took strong exception to this and wrote to the Police Office at Auckland the following letter. I have the honour to bring under your notice what I consider a case of great misconduct of Constable Haddock the Clerk of the S.M. Court in Warkworth. I am the Public Vaccinator. The Department of Wellington considers I am not carrying out my duty as I am allowing many to break the law but I am frustrated by Constable Haddock who is the ringleader of those who refuse to obey the law. It is hopeless for me to try and enforce the law while Constable Haddock who is paid to see that the law is carried out is the instigator and encourager of this law-breaking. What am I to do? This letter was sent to the Commissioner of Police in Wellington and as a result Inspector Hickson was sent to Warkworth to inquire into the actions of Constable Haddock. 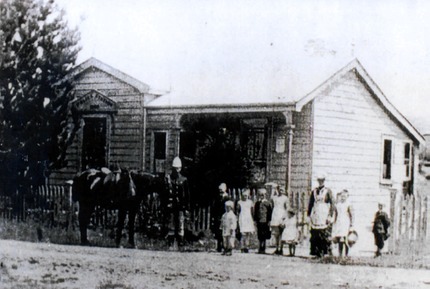 The John Haddock Family in front of the house at Warkworth Police Station and Court House. 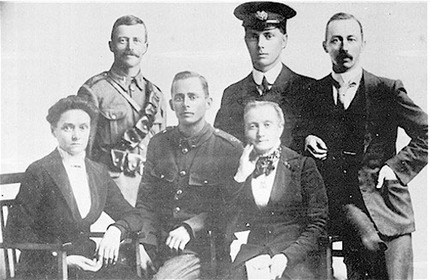 From left: John (constable, Ted, Bert, Emily, Moss (John), Evelyn (Deedee), Ada (died at 4 years old), Sarah, Bell and Bill (William). This man interviewed Mr Jordon, the local Justice of the Peace, Dr Shoesmith (The Public Vaccinator), and then held a court of inquiry into the behaviour of Constable Haddock. the Inspector acted as both the presiding officer and the prosecution. such a combination is incompatible with fair play, which John later pointed out to A.R. Bush who acted as the presiding magistrate. "….From all the circumstances I am of the opinion that the defects in the information and summones were wilful on the part of the Clerk of Court (Constable Haddock) because he is opposed to vaccination and because he was a defendant, and I quite agree with Mr. Jordon's remarks that the constable's actions were treacherous and furtheer they tendered to bring the administration of the law into contempt and I am of the opinion that a constable guilty of such conduct cannot be trusted and is unfit to be retained in the Public Service…"
Signed by A.V. Bush S.M. Consequently John Haddock was removed from the police force. He was tendered a cheque for 9 pounds for pay owing to him from 1st to 14th June 1895, but it remained in the governemnt purse. John declined it owing to the unsatisfactory nature of his dismissal. He was not asked to sign the quittance sheet as is usual on a member being svered from the force. Upon being dismissed John shifterd his family into a cottage at 5 Pratt Street, Ponsonby, in Auckland. From there he worked as a clerk in Howe Street by day, and we are guessing that by night he began to delve into and unravel the events which lead to his dismissal. There was a huge groundswell of disapproval at what had happened to John, both from the public and from withinn the police force. A petition was sent to the House of Representatives with enough signatures that it demanded an enquiry be carried out regarding the circumstances of his dismissal. Sarah (Qualtrough) Haddock with five of her family in 1914. From Left Back: William, Bertie Mervyn (Pat), Edwin. Front: Winnie Bella (Bell, John Mosstown (Moss), Sarah. Later on the case resulted in the following comments from a Parliamentry Committee: "…..That the Committee have again gone into the circumstances of the case, and have also examined Constable Haddock upon the matter. The Committee exceedingly regrets that the Government has not seen fit to carry into effect the recommendations made last session, and can but reiterate the same - namely, 'Thet an inquiry should be held into the circumstances connected with and which lead up to the dismissal of Constable Haddock, lately of Warkworth'….."
John decided to break in land in the Waikato. William and Herbert went off with John to farm at Karamu in the Waipa County. The life was considered too rough and rigorous for the womenfolk so John installed Sarah and the girls in a comfortable cottage in Pratt St, Ponsonby, Auckland. Edwin and Moss also stayed with their mother and worked in Auckland. After some years farming, John became ill and returned to the family in Pratt St, where he died in 1903.